1) Hirochi Robaina’s “HR” cigar brand has started to appear at tobacconists across the U.S. HR, which is crafted in Estelí, Nicaragua, is the first non-Cuban made by the Robaina, proprietor of the Vegas Robaina farm in Pinar del Río, Cuba. According to a July press release, “The HR blend is a collaborative effort between Hirochi and Don Omar González” and features an Ecuadorian Habano 2000 hybrid wrapper around Nicaraguan binder and filler tobaccos. Four sizes are available—Belicoso (5.5 x 52), Hermoso (5.1 x 48), Toro (6 x 52), and Sublime (6.5 x 54)—with each selling in the super-premium $19 to $22 range. 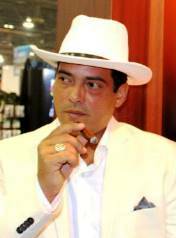 Hirochi Robaina is the grandson of the legendary (and late) Alejandro Robaina, a “roving ambassador for Cuban cigars” who is remembered as Cuba’s foremost producer of top wrapper leaves and for being the voice of small tobacco growers in Pinar del Río. 3) Love it or hate it, there’s no denying Cigar Aficionado’s impact with its annual Top 25 and Cigar of the Year awards. The magazine will begin counting down on its website on December 15 with the 10, 9, and 8 selections, going down to the No. 1 slot on Dec. 18. Then, over the following two days, they’ll list 11-25 and their best bargains. 4) Inside the Industry: Señorial by José Blanco is shipping its limited edition cigar to celebrate Blanco’s 65th birthday. The Perfecto Elegance (5.75 x 55) is a $14 Dominican puro. 5) Deal of the Week: E.P. Carrillo is exclusively releasing two cigars as part of Bespoke Post, a monthly “box of awesome items” delivered to your door. The $45 (shipping included) “Churchill” box includes four E.P. Carrillo cigars (similar to the exclusive Bespoke Post cigar we wrote about here) along with cedar spills, a handcrafted wood ashtray/candle holder, candle, and cigar cutter. Past boxes include fine bar accessories, shaving kits, coffee, BBQ kits, and more. You can always skip months or cancel at anytime. Click here to sign up.